Where did J. M. W. Turner grow up? Joseph Mallord William Turner was born above his father's barber shop in London, England on April 23, 1775. Joseph began to sketch pictures when he was a young boy. He enjoyed drawing outside pictures, especially buildings. Some of his drawings were sold from his father's shop. When he was just fourteen years old he began to attend the Royal Academy of Art in London. He continued to sketch and work with water colors. Many of his sketches appeared in magazines. While he mostly sketched buildings and architecture, he also started to draw some pictures of the sea. 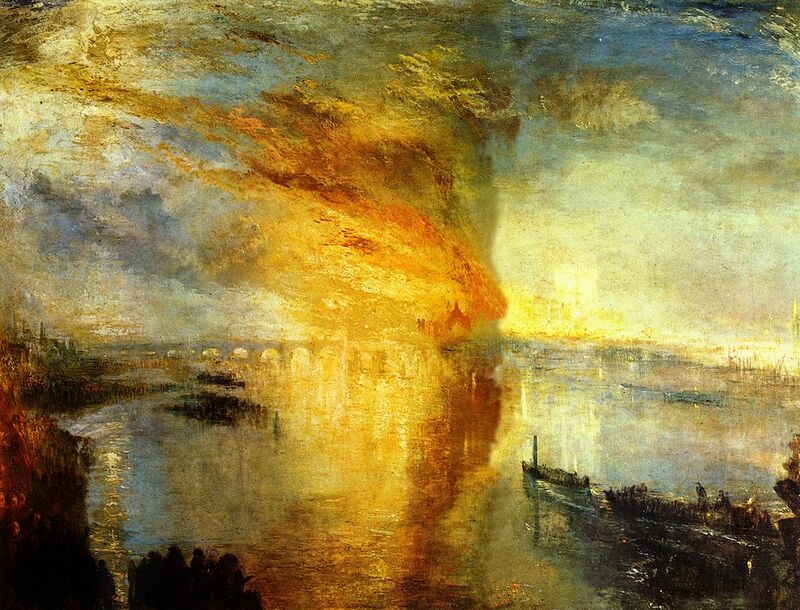 Turner painted his first oil painting in 1796. It was called Fishermen at Sea. 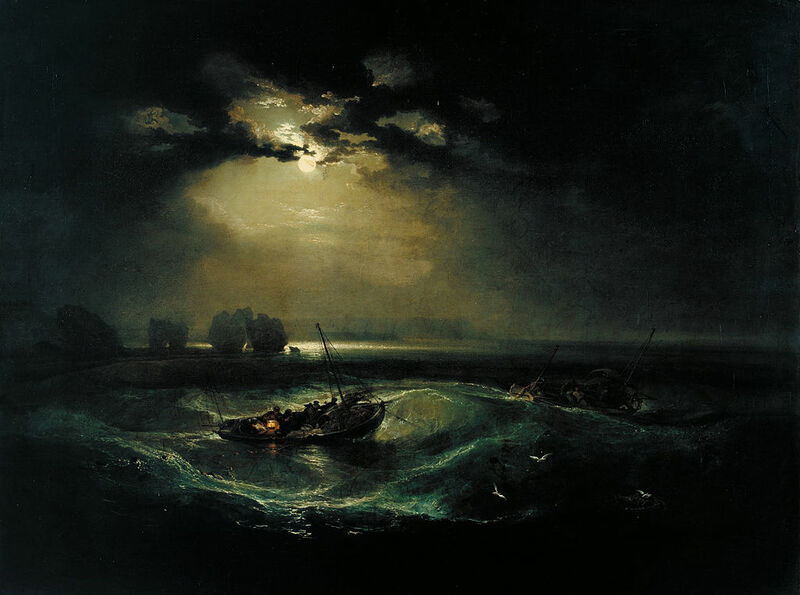 Critics loved the painting and Turner gained a national reputation as a talented artist. Many compared his works to that of other famous painters. Turner was fascinated by the power of God in scenes of nature, especially the ocean and the sun. He would make many sketches in numbered notebooks and then use those for reference when he painted in his studio. He would often place people in his paintings, but they would be small and insignificant when compared to the power of nature around them. As Turner's work continued to mature, he paid less attention to detail and more to the energy of the natural phenomenon he was painting such as the sea, a storm, a fire, or the sun. The objects in the paintings became less recognizable. One example of this is the painting Rain, Steam, and Speed. This landscape of a locomotive crossing a bridge uses light and mist to give power to the train engine as it moves down the track. The emphasis is on the hue and the changing light as the train passes through the land. Many of Turner's later works resemble the Impressionist style of painting that was to emerge in France in years to come. 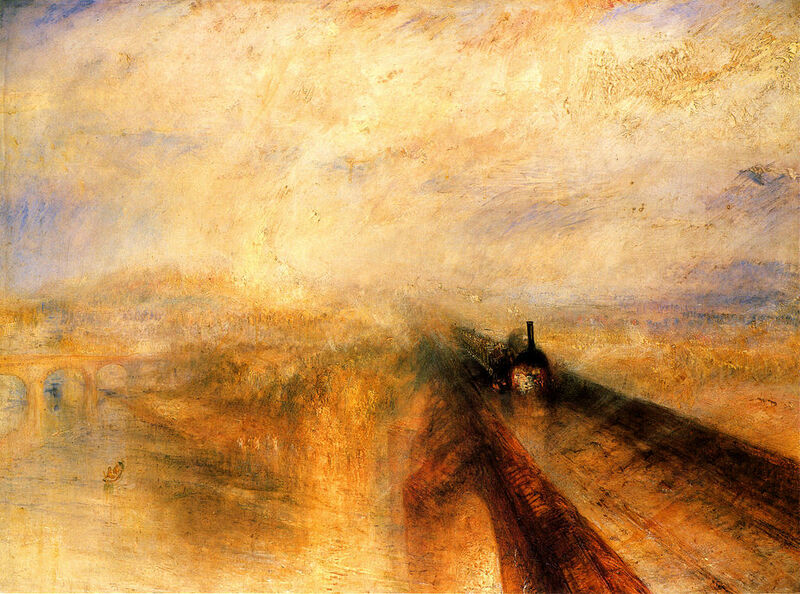 Turner's work no doubt influenced artists such as Monet, Degas, and Renoir. 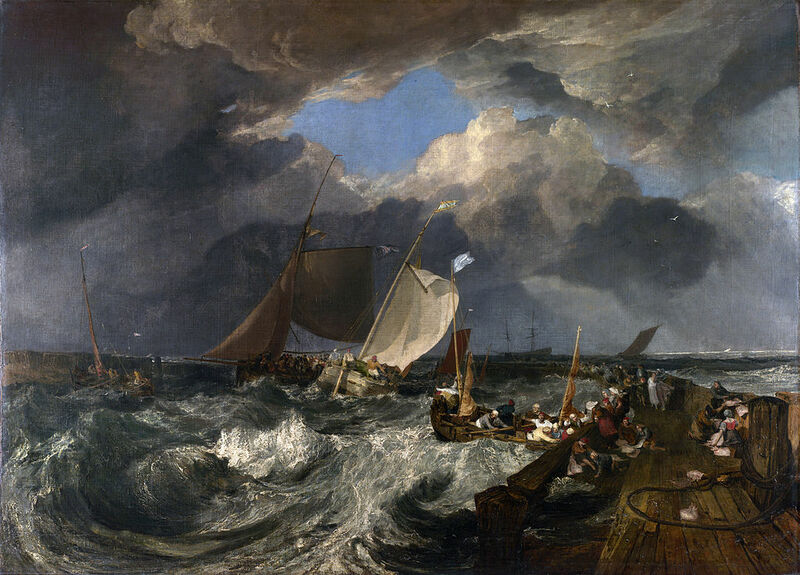 J. M. W. Turner is considered by many art historians to be the greatest landscape painter in history. His artwork had a major influence on many artists to come after him including inspiring many of the impressionist artists. He never married, but his father lived with him for 30 years, sometimes working as his assistant. Legend has it that he had himself tied to the mast of a ship during a storm so he could experience the power of the sea first hand. His friends called him William. His personal favorite of all of his paintings was Dido Building Carthage. He enjoyed traveling to Italy, especially Venice which inspired a number of his paintings. He gave some of his paintings really long titles in order explain them. One was titled "Snow Storm: Steam-boat off a Harbour's Mouth Making Signals in Shallow Water, and Going by the Lead. The Author was in this Storm on the Night the Ariel left Harwich". Wow, that is one long title for a painting!